Evening Echo | Enough Talk, More Writing! To start with, I would like to thank all 13 people who completed the trial poll since it has been posted, two posts ago. Mucho gracias to those 13. As for all the others, just know that WordPress gives daily readers figures, I shall be noting this for the future. While I am at it, I suppose, I would also like to thank those who put their sitcom name suggestion into the hat for the big prize I put on offer. Ha. Thanks to all those entries. 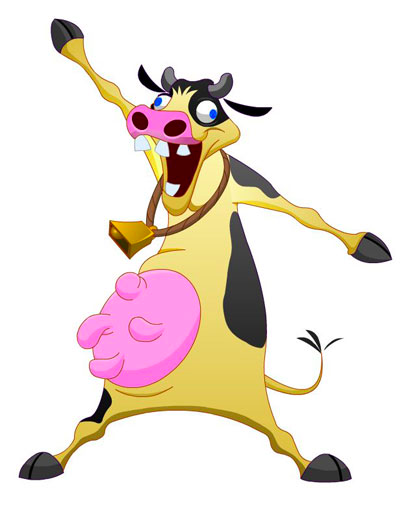 Although, it is a one man show after all, so the lack of entries will not be held against anyone. Now that that is out of the way, I must tell you my head is broiled. Seeing as I am on the healthy eating route these days, saying it is fried just no longer sounds right. In case you do not yet know, as with most things I have been doing lately, I am learning by numbers, slowly but surely, as I go along. The same applies to this writing malarky. Especially when I am trying to be clever and come up with an immense sitcom episode that I can pass around to people in L.A, to show off my writing work. Tiring work I must say, my brain is not happy with me. So, seeing as it has been a fairly long day for my writing brain, I have decided to give it a bit of a break tonight. A few funny stories have been building up, along with ridiculously good writing advice, which I feel I should pass along, seeing as I got it for free myself. Just not tonight. Instead I shall post two published pieces of work, which a few people have been asking for or asked to see before. 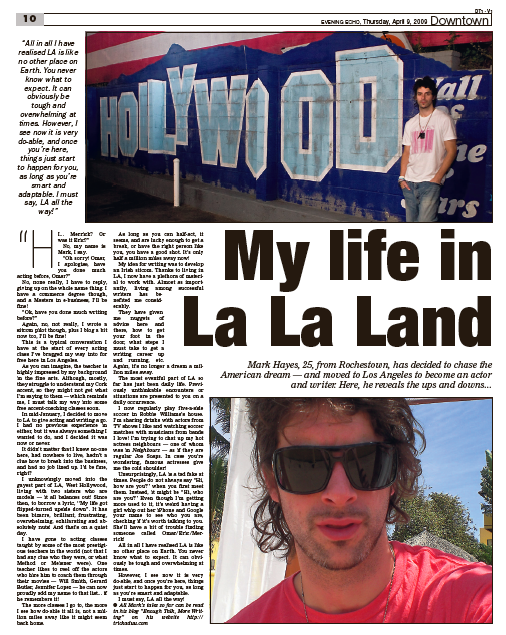 The first is a watered down article I did for a newspaper back home a while back, edited on but not too bad I suppose. The second is an interview I did (electronically) for a new magazine, The Corkonian! Unfortunately, for some reason, I cannot upload them up as the pdf files I have, complete with newspaper/magazine design and all, so text alone will have to do. “HI… Merrick? Or was it Eric?” No, my name is Mark, I say. “Oh sorry! Omar, I apologise, have you done much acting before Omar?” No, none really, I have to reply, giving up on the whole name thing. I have a commerce degree though, and a Masters in e-business, I’ll be fine! “Ok, have you done much writing before?” Again, no, not really, I wrote a sitcom pilot though, plus I blog a bit now too, I’ll be fine! This is a typical conversation I have at the start of every acting class I’ve bragged my way into for free here in Los Angeles. As you can imagine, the teacher is highly impressed by my background in the fine arts. Although, mostly, they struggle to understand my Cork accent, so they might not get what I’m saying to them — which reminds me, I must talk my way into some free accent-coaching classes soon. In mid-January, I decided to move to LA to give acting and writing a go. I had no previous experience in either, but it was always something I wanted to do, and I decided it was now or never. It didn’t matter that I knew no-one here, had nowhere to live, hadn’t a clue how to break into the business, and had no job lined up. I’d be fine, right? I unknowingly moved into the gayest part of LA, West Hollywood, living with two sisters who are models — it all balances out! Since then, to borrow a lyric, “My life got flipped-turned upside down”. It has been bizarre, brilliant, frustrating, overwhelming, exhilarating and absolutely nuts! And that’s on a quiet day. I have gone to acting classes taught by some of the most prestigious teachers in the world (not that I had any clue who they were, or what Method or Meisner were). One teacher likes to reel off the actors who hire him to coach them through their movies — Will Smith, Gerard Butler, Jennifer Lopez — he can now proudly add my name to that list… if he remembers it! The more classes I go to, the more I see how do-able it all is, not a million miles away like it might seem back home. As long as you can half-act, it seems, and are lucky enough to get a break, or have the right person like you, you have a good shot. It’s only half a million miles away now! 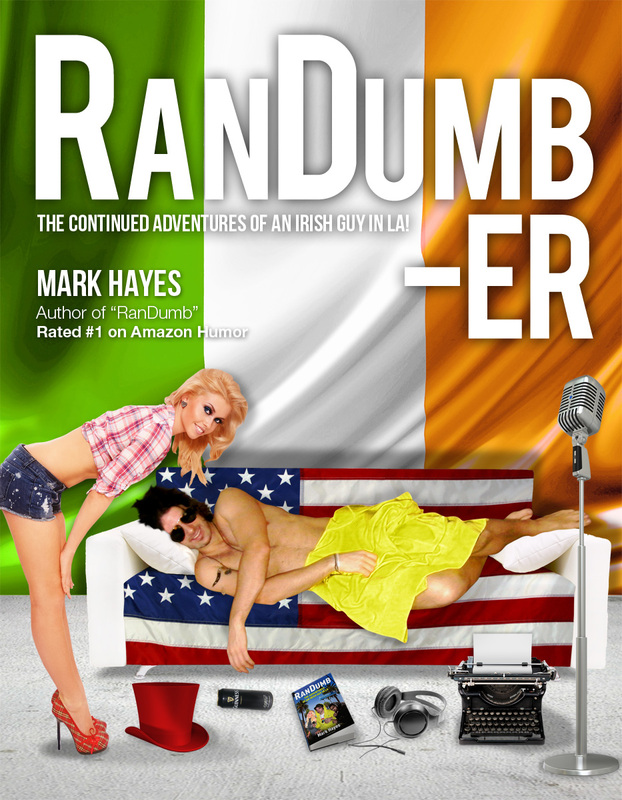 My idea for writing was to develop an Irish sitcom. Thanks to living in LA, I now have a plethora of material to work with. Almost as importantly, living among successful writers has benefited me considerably. They have given me nuggets of advice here and here, how to get your foot in the door, what steps I must take to get a writing career up and running, etc. Again, it’s no longer a dream a million miles away. The most eventful part of LA so far has just been daily life. Previously unthinkable encounters or situations are presented to you on a daily occurrence. I now regularly play five-a-side soccer in Robbie Williams’s house. I’m sharing drinks with actors from TV shows I like and watching soccer matches with musicians from bands I love! I’m trying to chat up my hot actress neighbours — one of whom was in Neighbours — as if they are regular Joe Soaps. In case you’re wondering, famous actresses give the cold shoulder the exact same as a regular old Josephine Soap would do! Unsurprisingly, LA is a tad fake at times. People do not always say “Hi, how are you?” when you first meet them. Instead, it might be “Hi, who are you?” Even though I’m getting more used to it, it’s weird having a girl whip out her iPhone and Google your name to see who you are, checking if it’s worth talking to you. She’ll have a bit of trouble finding someone called Omar/Eric/Merrick! All in all I have realised LA is like no other place on Earth. You never know what to expect. It can obviously be tough and overwhelming at times. However, I see now it is very do-able, and once you’re here, things just start to happen for you, as long as you’re smart and adaptable. I must say, LA all the way! WHERE IN CORK ARE YOU FROM? WHY DID YOU CHOOSE TO LIVE IN LA? I wanted to give acting and writing a go, even though I never really tried either before. Plus, being LA was an added bonus. WITH NO PRIOR EXPERIENCE, WHAT MAKES YOU THINK YOU CAN BREAK INTO ACTING? I have faith in my abilities! I figured if there were so many bad actors in movies and on TV, surely there was room for one more. HAVE YOU GOT ANY WORK YET? I have no average day really. It usually just involves a random comedy of errors, which is why I set up my blog, http://trickaduu.com. WAS IT DIFFICULT TO LEAVE YOUR FRIENDS AND FAMILY? WHAT IS THE MAIN DIFFERENCE BETWEEN LIFE IN LA AND LIFE IN CORK? Weather, people, food, quality of life, random daily encounters with famous people, value for money. Not too much really, so. 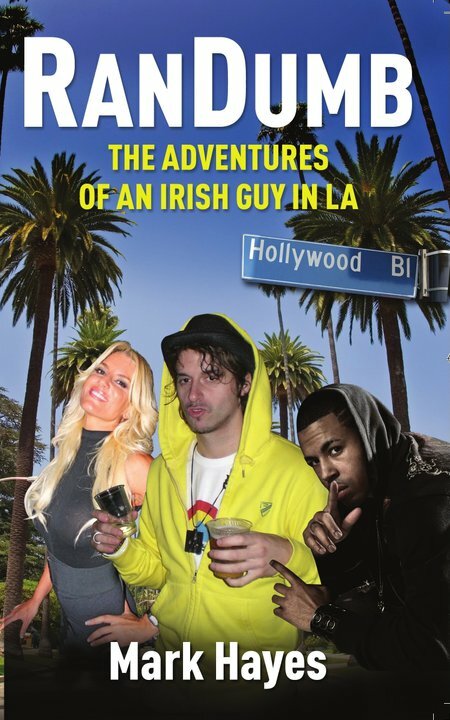 IS THERE AS MUCH RECESSION DOOM AND GLOOM IN LA AS THERE IS IN IRELAND? IF NOT, WHY DO YOU THINK THAT IS? There’s not really as much doom and gloom in LA as there is in other parts of America I’ve been to recently. LA is a bubble of optimism/people fooling themselves, so the recession is kept out. People don’t really moan here so I haven’t even heard one person mention the big ‘R’. WHAT’S THE ONE THING YOU MISS MOST ABOUT CORK AND LIVING IN IRELAND? HOW OFTEN DO YOU COME HOME? Everyday. I am not homeless yet. I don’t have to go online anymore to buy nice clothes. WOULD YOU DO IT ALL AGAIN? WOULD YOU DO ANYTHING DIFFERENTLY? Its not fully done yet! If I could do one thing differently, it would be to choose to win the lotto before I left. HOW DOES THE HEALTHCARE COMPARE? WHAT DO YOU PAY AND HAVE YOU EVER HAD TO USE THE US HEALTHCARE SYSTEM? WHAT ABOUT WORK PERMITS ETC., DID YOU FIND IT DIFFICULT TO GET CLEARANCE TO WORK? HOW DOES YOUR WEEKLY SHOPPING BILL COMPARE TO THAT OF SOMEONE IN IRELAND? I can’t remember the last time I did a weekly shop in Ireland. The food here is cheap though, plus it’s good quality as well. I could buy a mountain of food for myself to last the week for about $70? Trader Joe’s all the way! WHAT ABOUT SOCIALISING, WHAT DOES THE AVERAGE NIGHT OUT INVOLVE AN WHAT DOES IT COST? A lot of my nights out have been either hit or miss in LA. I think the nights where I have tried to do my own thing have been the worst. And also the ones where I have spent the most money. Other nights, usually if I head out with my roommates, I might be at a table in a cool club with free drink, no charge at the door, and not have to worry about a cab home. Just one of many perks living with two sisters who are models. A reoccurring theme on most nights out involves girls asking me “Who are you?” and then Googling my name in front of me on their iPhones. I have gotten used to the look of disappointment on their faces at this stage. WHERE DO LA DWELLERS GO ON HOLIDAY? Mexico, Hawaii, or Dingle usually. DO YOU PLAN TO REMAIN IN LA OR WILL YOU EVENTUALLY COME HOME FOR GOOD? I plan to stay here for as long as I can, or need to, but I have no clue how long that will be. I could be sent home by the time this article is published!